The new version of Skype-wrapper fixes some small bugs and brings full support for Ubuntu 12.04 Precise , even making some additional features, such as dedicated quicklist. 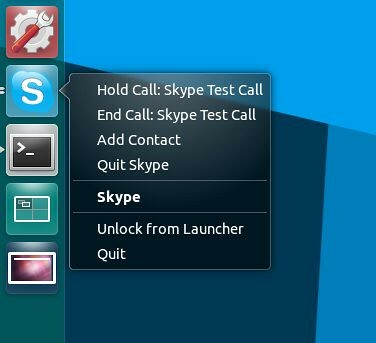 The new Skype-quicklist Wrapper allows us to make the test call to Skype, add a new contact or close Skype . In the case of new posts, we will find the link in the launcher, the number of unread messages, with the possibility of access to reading with a simple click. In addition, Skype Wrapper allows us to accept or reject new incoming calls, and if we are busy we can also terminate or withhold the call. In standby mode can reject incoming calls, or decide whether to respond to only a few contacts. No Comment to " Install Skype-Wrapper in Ubuntu 12.04 "